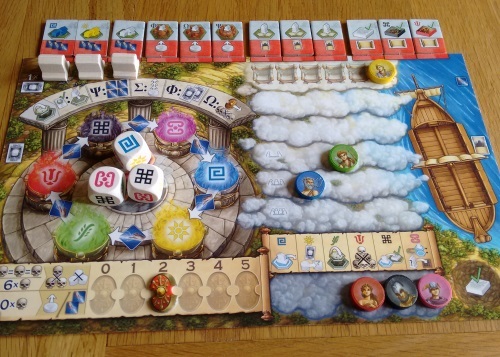 The Oracle of Delphi* is a medium weight euro game for two-to-four players that plays out in one to two hours (and is good at all player counts). It’s not for beginners or youngsters (I think probably 10-12+), but seasoned gamers will feel on safe ground with its blend of familiar euro mechanisms. But that said, those who aren’t keen on designer Stefan Feld’s recent output shouldn’t tune out yet: Delphi has some interesting twists and ideas to remind the doubters that he’s not all about the now infamous ‘point salad’ approach. While definitely a euro, this is a race to the finish that rewards the best combination of great planning (strategy) and dealing with the restrictions of the dice you roll each round, and what the other players do that may scupper your plans (tactics). And while half of the game revolves around pick-up-and-deliver, there are also elements of pure tile-flipping, dice rolling luck. And why that may sound a little odd, it largely works really well. While I’m sure this statement will leave some gnashing their teeth, I think the theme is realised pretty well here. You’re sailing and questing and getting gods to help you, which fits, and while it breaks down in a few places it holds up pretty well. You’re unlikely to be immersed in the theme, but it does help in game explanation and understanding. It looks lovely too, with the exception of one very poor colour clash (red and pink) which is at least partly solved by good use of symbols (although they even managed to make the red and pink symbols the most similar looking ones). The layout and graphic design work well and you get plenty of bits for your buck: 18 modular board tiles, more than 100 each of cards, wooden and cardboard tiles and tokens, plus player boards and reference cards – sound value for your £40. While there’s quite a lot going on in Oracle of Delphi, there is very little hidden information and the basic concepts are simple: the biggest issue is remembering all the little details, but these can all be explained over and again as you play without giving much away. Players will have an equal amount of turns in the game, which simply goes around the board clockwise throughout. You’re each aiming to complete 12 tasks (everyone has the same ones) and the player who does this first, wins. If two or more of you finish on the same turn there are two tie-breakers – otherwise it’s a shared victory. Many games seem to go down to the tie-breakers, but thankfully they’re meaningful (more on this later). The crux of the game is efficiency. Each turn you’ll each individually roll three dice – each side of which has a different colour, rather than a number – which you’ll then use to perform actions. The majority of things you need to do are colour specific (moving your ship, doing tasks etc), but you have a few colour-neutral options that either allow you to defer an action (you instead draw a coloured card you can use as an extra action in a later turn), or take tokens that let you change dice colours and mitigate your rolls. The 12 tasks are split between 6 pick-up-and-deliver, 3 fighting and 3 discovery. Four of the six pick-up quests – and two of the battles – are the same for all players, and there are only exactly enough items/creatures for the number of players. This means you’re all fighting for the same things on the board, all of which are randomly placed at the start of each game – so finding the most efficient routes can be key to success. Fighting (more on this later) and discovery tasks have a random element. Discovery see you flipping tiles to find those matching your player colour. If you reveal one of yours, bingo – you completed the quest. If you reveal an opponent’s, they know where it is – but you get a tasty bonus. There is also an action to use a neutral dice to peek at a couple of tiles without revealing them. Each time you finish a task, you’ll receive a reward. The best of these give companions (for raising statues) and equipment (when defeating monsters); both of which give either constant or one-time bonuses. Depending on when in the game you pick them up, and what tasks you have left, you will choose different ones each time – which really helps the game’s replayability; and also means there is no ‘right’ way to go about your tasks. The writer: I need to give mention to the gods. There are six (one for each dice colour), each of which you can influence – and when you get them to a certain level on your player board, they’ll grant you a favour. These are big, one-off bonuses that can swing the whole game for you if you time them right – move to anywhere on the board, kill any monster, all dice are wild this turn etc. Again, it’s all about the timing and just shows another layer of detail in a deep, enjoyable and original game – but one which doesn’t overwhelm, or feel as if it has more moving parts than it needs. The thinker: In the main I think this is a great title, but I cannot fathom the decision to make the monster fights so random. Where is the sense in a battle potentially taking the equivalent of two or even three turns for one player (in lost resources), and one for another, just on the role of a dice? Sure, you can mitigate it by doing other quests first and claiming shields – but those shields are taken at the expense of other goodies and you may not even need them. I’ll still play, but this does irk me – especially as the rest of the game is such a breath of fresh air. The trasher: Oh stop whinging! As mentioned, you can mitigate by doing those tasks last, getting shields or getting gods to help – no big deal. 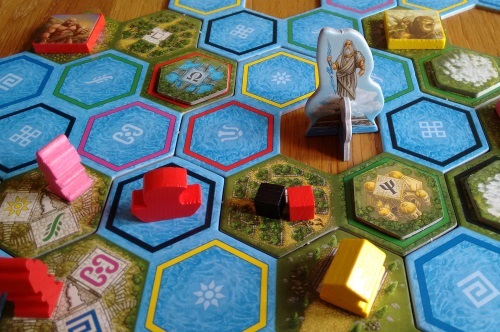 The real fun in Oracle of Delphi is the race for the good routes. You’ll all need to deliver much of the same stuff, so the first thing you’ll do is spot where the items you all need are – then the race is on. Grabbing something first can really make a difference and you can get a surprising distance in a turn. But it’s equally viable to potter off elsewhere and build your bonuses up, then do the longer routes with ease later. A very good game. The dabbler: This game is at the upper limit of my enjoyment in terms of complexity, but I thoroughly enjoy playing. It looks great on the table and has just enough theme to make the slightly complex rules make more sense, while the fact you’re all going for the same things helps get the banter going. Flipping secret tiles adds a bit of suspense, the dice keep things random and the suspense as you all start to get down to just a few tasks left adds some real drama. A surprise hit for me, as I thought it would be a little too much. Will you like this if you hate Stefan Feld games? Unlikely. It has many of his signature moves, just in different packaging – but it is wort giving a go, to see if the race element is enough to capture your imagination. I don’t buy the accusation that once you’re behind, you’re finished – not unless you’re playing terribly, as in any other game, ever. Some tasks are just quicker than others, so it can look like you’re behind – but you can catch up fast, which can be quite a thrill (in a slow euro game kind of way, hehe). As mentioned above, the fights will annoy some. Unmitigated, you roll a 10-sided dice and have a one-in-10 chance of success; then if you fail, you can pay a favour token to go again with one better chance – and on you go until you get it right. This means you can fluke it in one go, or potentially lose a bunch of favour tokens in the process – and gaining just two favour tokens is a dice action (although they are often available by other means). Also, a roll of zero sees you take an injury, which can be devastating. Injuries are another random elements – and will also be annoying to some. They again come in the six dice colours and if you get three of the same colour – or six in total – you’ll lose a turn. Yes, you heard that right – you’ll lose a turn. These injuries can be removed by a dice of the correct colour, and you only have to be below the injury count at the end of your turn (they are ‘counted’ at the start of your next turn), but it’s possible to be caught out – especially as a random wound (or two) often hit you at the end of a round. I’ve seen a player with a green wound pick up two more green wounds (which couldn’t be avoided) at the end of a turn, and lose a turn; and then be one turn behind the winner… Rare, but grim. No one likes tie-breakers, but at least in Oracle of Delphi they make sense. This is a race, and the first tie-breaker is most oracle cards – which you largely get when deferring a dice for a later round, as its colour is no use to you. This means there’s a good chance those actions won’t be wasted if you still have them at the end, as they could see you sneak the win. The second tie-breaker is favour tokens – which you tend to use to improve actions as you go. So if you’ve been efficient, you’ll have more left over. I also want to praise the modular board as I’m often quite sniffy about them. I see little replay value in them in a game such as Hawaii, where they don’t really seem to do much; but in Delphi you can make boards that really affect the longevity and difficulty of the game. Keep it tight for a fast game, or long and sprawling for a complex one. Top marks. And finally, each player starts with a ship upgrade which means there’s that little bit of uniqueness to the way you’ll play the game. They seem pretty well balanced but most importantly they really do influence how you go about your turns – and there is enough of them in the box to give everyone a choice of a few options. 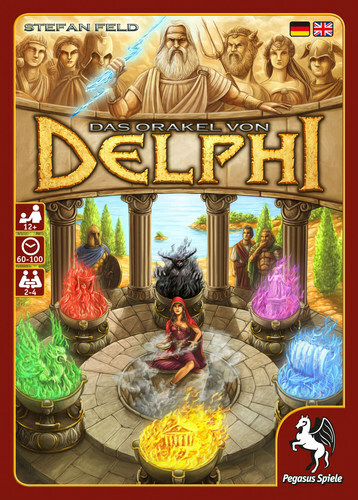 I’m a big fan of the designer, but had grown tired of the steady flow of similar games; so I’m pleased to say The Oracle of Delphi has renewed my faith in Feld. This was the last game from Essen I got to the table, because I was worried about being disappointed. But it’s now in my top three 2016 releases with Terraforming Mars and Lorenzo il Magnifico. Sure, there is a lot of moving parts and you could argue there is a fair amount of Feldy ‘salad’ going on with mechanisms and components, if not ways to score. But the game comes together so beautifully I find myself totally engaged in the race, even if it is a very slow one. Those walking away due to the few odd random elements I can understand – but for me, they add a bit of personality and I can forgive them for what they bring to the party. After all, what kind of race can be scripted throughout? * I would like to thank Pegasus Spiel for providing a copy of the game for review.. 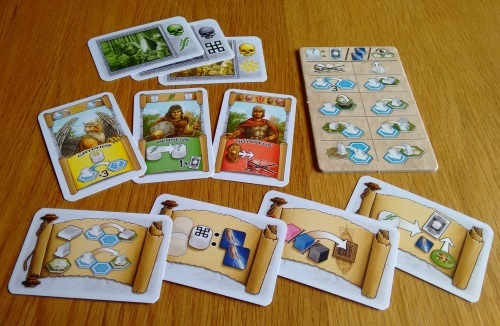 This entry was posted in Board games, Games and tagged board game reviews by Chris Marling. Bookmark the permalink.